VIDEO available: This Silent Night arrangement coordinates with a movie showing stunning images of stained glass windows. Each window shows the life of Christ from the nativity scene to the resurrection. This movie can be displayed on any multimedia player (Power Point, etc.) while the performers provide the music background. Markings and anchor points in the music allow the performers to line up with the video. 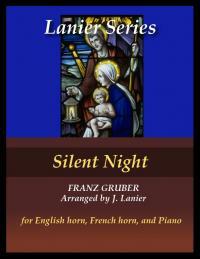 Churches request Silent Night and the video every year to bring a special Christmas message to their congregations. Click here to purchase the video.